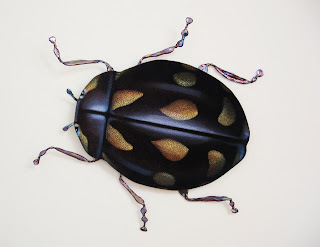 So I am well on the way to an exhibition of velvets now, with 5 beetles, 2 birds, 8 flowers and 5 more pieces in progress... here is what I am up to and some of what you can expect at the Delux Cafe in December. 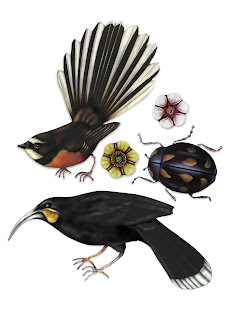 Piwakawaka, Huia, Tasman Ladybird, Manuka and Mountain Buttercup. The birds measure around 50-60cm beak to tail. It's a slow process but a very satisfying one. It's a transformational piece, very clever inside out stuff with a crinoline. Glows like crazy under black light. I've been experimenting with airbrushing on velvet and here's what I've come up with. This is a Tasman Ladybird and the first of a series I am doing of birds and bugs for an exhibition at the Delux Cafe, Kent Tce, Wellington in December. Who said painting on velvet had to be big breasted women or matadors? 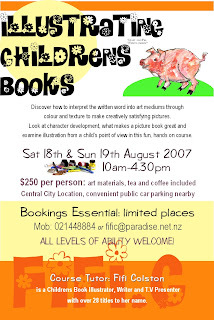 Here's something you could do this August; foray into the delightful world of Book Illustration! Get to grips with characters, storylines, paint and pencils with me whilst my lovely assistant makes you lovely coffee and plies you with biscuits...at my studio in town. I had the car loaded with every conceivable piece of creative gear needed for a month long residency in Mt Bruce. Fabric, paint, dressmakers dummy, foam and heat gun for Wearable Art. Paints, paper, glue, brushes, tape, egg cartons pom-poms and pinecones for craft devisings. Laptop, screen, printer, scanner, wacom tablet and wireless keyboard for writing and graphics. Hairdryer, straightening irons, hair product and Katmandu jacket for keeping warm and looking good. I probably didn’t need to worry about the last bits. For here I am, in the countryside with two other women artists; Dorothy and Kyle and the director, Kay. It is absolutely fine to go bra-less and make-up less, although it seems we all take a small pride in our appearance, having spotted Dorothy with her hair in rollers this morning as she emerged from her sculptors cottage. Kyle is young so just looks great anyway. Last night we ate communally and as food arrived. I, with a quiche bought on the way, Dorothy with excellent Guacamole (she lived in El Paso) and Kay with soba noodles and field mushrooms- the latter picked up on a hike across the farm. My sister Morag told me about her herd testing days in Eketahuna (5kms from here); the only memorable thing being the excellent fungi well manured by the cattle she tended. Beautiful white caps, with pale, delicate frills underneath. Delicious. Still, this residency is not about food. Indeed I have been saying loudly that I shall live on poached eggs on toast for the duration, such is my growing aversion to cooking. The aversion also includes housework and gardening; which is just housework outside. Weeding equals cleaning; lots of work to look good for five minutes and in no time at all it’s right back to a terrible mess. Dust, dandelions- they’re all the same to me. So given that I find little creative fulfillment in domestic duties, it is no wonder I leapt at the possibility of working in a well lit loft, in a villa that is cleaned by a housekeeper and a garden I can appreciate and not have to pull one piece of convolvulus from. I have spent the morning setting up my space and deciding which area of this curious attic will suit my different activities. I find great joy in the ritual of setting out my coloured pencils, plugging in cables and laying out scissors. It’s necessary for me to start with order and let chaos follow, uninterrupted by anyone except myself. The clockmakers bench houses my painting paraphernalia. This is an historical spot, where the clockmaker who built this house in 1910 worked on his mechanisms and possibly escaped his wife and three daughters. The timekeeper’s version of a bloke’s shed. My sewing machine; ready to make a giant black crinoline upon which my wearable art will grow, sits under the skylight, where the light is great for peering at black fabric and stitching. The computer set up is in the shadiest part of the room, which is where I sit now. There are two alcoves with comfortable beds for afternoon naps, should I feel the need for dreamtime and books line the walls for inspiration and distraction. I thought I was a late riser at 9am, but I was the first up to greet the sunshine, open the blinds and scurry across State Highway 2 in my dressing gown to pick up the Dom Post. Kyle works at 2am and rises at 11; Kay eats dinner at 10pm, just when I’m feeling distinctly like hitting the pillow. Dorothy emerges when the curlers have worked their magic. By 10am I decided it was time to familiarize myself with the big smoke, so off to Eketahuna I went. I ventured into the local farmers supply shop, looking for surplus hose-pipe and was helped by a very helpful young woman called Nicola. She knew all about me already. I guess there isn’t a lot going on in the town, so a visitor staying at ‘the old place down the road’ and from the Good Morning Show to boot was something to talk about. By the time I left, I had prices and meterage of all kinds of alkathene pipe and an offer of her 6 year old daughter to help with art and craft projects should I need an enthusiastic child. The next important sussing out was that of quality caffeine. There were two cafes to choose from and very hard to gauge from the exterior which would serve an approximation of an espresso. Both had net curtains and dim interiors, so I went for the ‘Country Café’. I immediately regretted walking in the front door as I was greeted by a dour faced matron behind the counter surrounded by ancient arts and crafts that had probably been their since I last visited as a child on holiday with parents, passing through. There were little flying witches on broomsticks which bore quite a resemblance to the café proprietor and reminded me that I need to dry out some apples to make wizened puppet heads for the Good Morning show. I pretended to look at bottles of Pump in the chiller until I saw that there was indeed a flat white on the menu board, not the dreaded filter coffee, so taking a gamble, I passed over $3.50 and stroked the cat which had entwined itself around my legs. Then my host was all smiles; nothing like brisk trade and cat appreciation to break down social barriers. Ten minutes later, my stomach gurgling with luke warm overly milky coffee, I took in the rest of what Eketahuna had to offer. An opportunity shop with a radio station attached and a show host who looked like he had arrived sometime in 1972, too stoned out of his tree to remember to leave. A Four Square (which also sold hose-pipe) and a tourist centre boasting an enormous 2d kiwi made from brush fence material. This is a source of pride in Eketahuna apparently, along with a large 3d one; it’s part of a branding campaign the locals are working on; ‘Kiwi Capital of New Zealand’ I think Otorahunga might have an issue with that though. Having done the shops and cafes (15 minutes tops, if you dawdled) I parked down by the cliff walk and had a stroll. It sounds more spectacular than it is, but pleasant all the same and if I felt if I need to throw my coffee up, no-one would notice there. A pair of boy’s shiny boxers, slipped loose from a towel and togs combo, greeted me at one point and pointed the way to the ‘Old Swimming Pool’. I was intrigued; fancy historic public baths being down a lane of macrocapas. I followed the sign, down a steep bank and to the river. Of course, a swimming hole; the place to be on a hot summers day. I tested the water with my hand; it froze immediately and reminded me that children are impervious to water and air temperatures; I used to be myself. All that is required in ones early years is the glimpse of blue sky and a flash of sunlight and off you go, stripping down to almost nothing and throwing yourself at the nearest puddle or sprinkler; or if you are really lucky, a body of near-arctic water. I returned from my walk, refreshed and energized to tackle the crinoline. I spent an hour threading hose into the casings I had made only to find it buckled and kinked all over the place, causing me to sweat and swear quite a bit in my attic. I reluctantly rang my Wellington millinery supplier for proper boning, which will be sent to me in a few days time. I shall donate the now redundant hosepipe to Kay’s hacienda and work on my writing in the meantime. Tomorrow will see a trip to the MT Bruce Wildlife sanctuary where I hope to find good reference of a bird skull and a decent flat white. There is rumour of the latter, but seeing as it specializes in live winged things, I may not find my bones. This morning Kay and I went to Eketahuna School to meet the Principal. I had an ulterior motive; I needed some enthusiastic Year 4’s to make pinecone creatures with me sometime after the school holidays and before I return to Wellington. Learning Media have picked up my ‘Bat Pig’ pine pal and need photos of children at work on them. We were treated to a sumptuous morning tea of cheerios with tomato sauce and freshly warmed hot cross buns dripping with butter. None of the teachers looked like they concerned themselves with the wholesome 5 plus a day regime, so I too dug in. I haven’t had a cheerio since our kids were having pirate and fairy birthday parties; they were delicious. We conscripted a few year 8’s for the forthcoming Anzac day activity (making giant poppies to adorn the ANZAC Memorial Bridge, in my official Bridge Fellow capacity) and waved goodbye until next term. I was very thrilled that ‘Janie Olive’ was in the school library and apparently much enjoyed by all. I took myself off to the Wildlife Reserve after lunch, where the coffee, sadly was mediocre, but the birds more rewarding. I watched the kakas being fed, observed a kiwi jumping around the kiwi house (yes, they do scurry and hop in a very busy fashion) and sat myself down to draw a tuatara in its enclosure. It’s quite satisfying drawing one from life because they hold a pose really well, for a very long time, without even blinking. The moment I finished it seemed to sense that its 15 minutes of fame were up and scurried off the log, to the disappointment of a large visiting group just arriving at the scene. They looked at my painting instead. Such a large dose of nature was enough for one day and I returned to work at my computer on my little crafty fairy. I think I have finally cracked the illustration style and a bit of text too, so tomorrow will see me working on a few layouts to see how it might all fit together. My boning arrives tomorrow too, so can take crinoline breaks, for something else to curse over when I can’t find solutions to my book design. Last night I stayed up late making 3D bird skull and flower templates from paper and tape for my Wearable Art piece. There were no surprise visits from rats whilst I worked away in the attic, and I didn’t hear them groaning either, so possibly they have taken themselves off somewhere else to die. Kyle hopes it’s not in her garage studio where she paints until the small hours. The boning didn’t turn up this morning, so Dorothy and I took ourselves off to Masterton to see ‘Miss Potter’ only to find that it had started screening an hour earlier than advertised on the net. ‘Oh bother’ we said in a genteel kind of fashion quietly swearing under our breaths and looked bereft, at which point the projectionist happened along and decided with the ticket seller lady that if no-one turned up for the next advertised film due on in 10 minutes, he’d screen Miss Potter just for us in the upstairs theatre. We asked if he was kidding and Dorothy pointed out that I was on the telly and therefore famous, and Doug (we are first name basis now) said that it was imperative that stars be entertained in Masterton and to go next door for a coffee until they were ready. As I sipped my third dismal flat white in the Wairarapa (I think Greytown does a good one; I’m getting further South daily) the projectionist came in and said ‘Ladies, if you would like to bring your drinks, Miss Potter is about to screen upstairs’. We had an entire theatre to ourselves, so chose centre seats and watched with amusement as Doug walked in with a huge reel of film over his shoulder and lugged it up to the projection room. Could you imagine that happening in Wellington? I don’t think so! So we soaked up Beatrix and her lovely bunnies, laughed and cried in all the right places and I was entranced from the first opening titles with close-ups of brushes and watercolors to the last closing credits. Oh the glorious ritual of opening a paint box, selecting a brush and putting the first breath holding mark on paper…not quite the same in Photoshop. 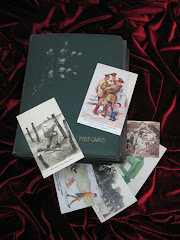 I have at home up in our own attic, a portfolio of artwork I did as a youth and on one carefully rendered page, sits the Tailor of Gloucester, on his cotton reel; a faithful copy of one clever woman artists work. She, unlike me, made a fortune from her lovely little books. I shall never make a fortune from copying others art or illustrating someone else’s stories, so this time to work on my own story and artwork without rushing it, is rare and wonderful indeed. After watching the movie I am inspired all over again, by the story of a woman who was particular about her work and never compromised it. And she drew from the heart. Tomorrow, Good Friday, I work all day. Not very Christian, but then neither am I. So here I sit at 10.35pm in my attic with a glass of wine (yes its true, I am an artist!). Good Friday has been good, most notably the success with my bird skulls and flowers fashioned from foam, spay painted with fluorescent Dazzle (did I say this was to be in the U.V section of Wearable Arts?). Not so good the green overspray on the deck…must get a bit of sandpaper to that before the director has something to say about it. My family can be happy that it’s not adorning the concrete path outside our kitchen though, or all over the basement as is usually my wont. Apart from working all day making flowers and skulls, there has been nothing to report except my exceptional dish of field mushrooms with parmesan and basil. I don’t think I have eaten one bit of meat in nearly a week; vegetables are so much easier for solo catering. Kay promises a chicken roast tomorrow night, so we can gorge on protein. Adrian arrives tomorrow for a visit. I miss him; I shall make pudding. Yes yes, I missed a day. Adrian arrived mid afternoon on Saturday and the day went by in a comfortable mix of me making more flowers and bird skulls, Adrian reading, and all of us eating and drinking wine in a very convivial fashion. This morning he had us all up in the loft doing stretches, which was appreciated by each artist as lower backs creaked back into position from days spent hunching over clay, paint and glue guns. Kay gave Adrian the grand tour of the property after which he burrowed about in the shed, found the lawn mower and proceeded to mow quite a degree of garden, plus turning a few large mounds of composting grass clippings. Kyle and I painted boiled eggs in a celebration of Easter and her long family tradition of egg decorating. Dorothy started to paint one but was scared off by Kay wielding a camera and took off back to her cottage. I don’t know why, she is hugely photogenic from the one pic I have seen taken unawares, but she has a huge phobia about the lens being pointed in her direction. Kyle is less shy, hence the pic attached, plus the photo of the eggs Adrian and I painted (yes, after his lawn mowing, he did art! ), and of course the man at rest in borrowed gumboots on the back steps. He took off back to Wellington at 5pm, leaving a very happy Kay with grass under control and me, sighing with pride at the lovely man who came, made friends and was so generous with his time, energy, conversation…and his wife. Eight days- how can that have gone so fast? I’m starting to panic that my 29 days will be up all too soon and I will return home with unfinished projects and things I forgot to do; like exercise. I worked in the attic all morning cutting yet more flowers and skulls; I have about a hundred now and find that the repetitive nature of such work fosters excellent creative thought in other projects (this I found out in a big way whilst sewing up faun costumes at Weta Workshop). I was all set to start a whole series of photographic images for my fairy book when I took a break for lunch and found the sun was out with a blue cloudless sky, the morning mist having lifted from Mt Bruce. This was spray painting weather indeed, so plans changed as plans do and I donned the respirator once more and took out another 30 flowers to undercoat. Watching, or even reading about paint drying is dull work and feeling like Mrs Blobby, found another woman feeling the same, so Dorothy and I went for a 4km walk along Kaipororo Road, down to the river and told each other about our lives, found interesting fungi to photograph and conjectured upon the beaten up car hoofing it’s way past us with a dreadlocked and sun glassed young man inside it. Word has it that people go up there to check their crops. We are not talking about wheat and barley. The day passed as they do all too quickly and I am about to join the others for a partial viewing of ‘Angels in America’, followed by Desperate Housewives, followed by more of the aforementioned movie- because we have worked hard all Easter and I am a D.H fanatic. I have introduced Dorothy to the programme, who never watches T.V back in the states and has now become a convert. It took a bit to fill her in on all the plot turns. I feel a little guilty that she may become an addict; television after all is opium for the mind. Tomorrow we go to Masterton; Dorothy to drop off her statue for firing and me to pick up the elusive boning. Friends arrive for lunch (though I have said a firm no to my Wellington Old Girls lunch group and all their offspring for a visit on Friday). Adele is an artist so she’s very curious about this place and Les is a builder so he’ll be interested in the renovations and besides, they are bringing a very nice onion tart form Greytown and some more foam from Wellington for me. How could I refuse? The very nicest thing about being here (apart from no housework and very little cooking) is the total absence of having to be anyone in particular. You may wonder what I mean by this, but for me, a gal who has spent her life trying to be important and noticed in my various capacities, this is an unexpected freedom. The e-mail has gone curiously quiet, and I only check it twice a day instead of the usual 50. Gone with it too are the requests and notifications that are ever present in my daily life. This includes invites to book launches, gallery openings, demands for comedy flyers advertising our latest shows and nagging for newsletters for group of which I am a front’s person. I’m on the telly; only because I pre-recorded it all before I went away and yesterday, I was moved to watch myself on the website to see what I had done. Wind Fish apparently; Japanese kite things made from lunch wrap. I watched and thought, ‘how involved; couldn’t care less’. 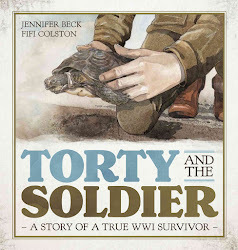 I will care, of course, back in Wellington, my work being utterly dependent on the publicity I generate for myself. After all, 46 and ¾ peri menopausal illustrators are hardly in demand by whipper snapper art directors, so I rely on generating suitable publicity for myself to make me a must have item, before I sink ungraciously into retirement years (I shall be a horrible senior citizen). But in the meantime, in Mt Bruce, where the stoat who gnawed on a baby rabbit outside the breakfast window this morning couldn’t give a rats arse (probably might have eaten one) who, or what I was, I am deliciously unburdened by my own ever hungry, never satisfied publicity machine. Last night I worked until midnight on the crinoline; the boning having arrived, and my visitors having disappeared. I swore and cursed in the usual way when sewing late at night with black thread on black fabric. This morning I started all over again and I am please to report, finally at 8pm- it works! It holds its shape when turned inside out and held over the head (like a naughty schoolgirl showing her knickers). This is pivotal to my creation working and has taken many hours of teeth gnashing to get there. I now have the utmost respect for seamstresses of old and the ridiculous garments they had to fashion. Tomorrow I will go back to my crafty fairy and her adventures and give the Wearable piece a rest for a day or two. Many things run through your head when creating works of art. The biggest one being; ‘What’s the point and does anyone really care? Friday 13th April – Day 12? The days are getting longer and so are my breaks between writing my journal. I stayed up late last night creating a present for Kyle, whose 26th birthday it was today. She was heading off to Wellington for the weekend and remarked that she always wore a tiara on her birthday, so I couldn’t let her down now could I. With the magic of EVA foam, fluorescent orange fabric and a conglomeration of sparkly pom poms and pipe cleaners, I created a truly, madly, artistically kitsch headpiece for the poor girl. She went off very happily on the train to the big smoke this morning wearing it. I stressed that if she lost it on Courtenay Place, it was O.K, she could still return home to the residency and no questions would be asked or hurt feelings thrown about like grass seed on a new section. Wellington, look out for a gal from the U.S with a silly crown this weekend. She will be pursuing men; the current joke here is that New Pacific Studio is a nunnery. Kay says it’s a hermitage. The old bloke at the Eketahuna radio station could get lucky someday, the appearance of men is so rare here. The dropping off of Kyle at the station involved a trip to Masterton which I nearly declined, but at the last minute (and the thought of a flat white from Moore Wilsons) I changed my mind; and I was very glad I did. You see, not only did I get a great coffee, I got two. One our favorite fresh food outlet and one at Aratoi, a wonderrful art gallery in town with a great café. If you are planning a trip here anytime in the future, take a minute (well an hour) to visit; and not just for the food and caffeine. They have a show on at the moment that I could have easily spent a couple of thousand dollars at (supposing I had that to spend). First up on my purchasing list was a frosted glass budgie. This may sounds really kitsch and a visit to their website might prove it in some ways, but the work is delicate and beautiful and very very clever. Have a look and scroll through all the images in their gallery. http://www.crystalchaingang.co.nz/index.html. They had a whole wall of crystal birds at $300 each- I would have liked 15 of them, but alas I am an artist, not a moneyed collector. Then there was a South African Ceramicist who works in Masterton at the community art space, with her exhibition entitled ‘Fetish’. She does a lot of stuff about cats and this one was done in fine porcelain, complete with lovingly made dead rats and mice. Whilst it all sounds weird, it was weirdly beautiful and I fell in love with one collection of pieces called ‘White Spray’ and once again…if I had that spare dosh I could give the family nightmares in feline form. A piece that made me laugh out loud was by a photographer John Casey. It was a photo of a dinosaur model covered in hundreds and thousands (sprinkles) and entitled ‘Hundreds and Thousands of Years Ago’. Comic brilliance. A few hundreds and thousands later and I could have been the owner (if they were for sale and they weren’t) of a Gottfried Lindauer painting. Such wonderful historic work, so close up. Still wanted a glass budgie though. From artwork bargains to those of a different kind I found in the local opportunity shop. A perfect black and white striped top to form the arm pieces of my Wearable Art, and a black skirt on which to build the trunk of a tree seen only in the underworld. Six whole dollars, and I don’t even have to sew in a zip. Such resource in rural New Zealand. I would have paid at least twelve in Wellington. Well I’m losing track of how many days I’ve been here, except that the poisoned rat in my attic studio has smelled for at least four, and today an angel in the form of Gavin, the builder came and fished it out. The ordure de ratty has dissipated and my loft is sweet smelling and conducive to creative process again. Such is life in a country villa. Yesterday heralded the Historic Places Trust meeting, which was to take place in the stinky loft. As the key participants were aged 70 plus, the stairs posed a problem and to their good fortune it was removed to the downstairs parlour. I have discovered something interesting about country women. They never ever use the dishwasher, preferring instead to occupy the sink with suds of bubbles and pull out the cobweb laden dish rack. They think it is a sign of weakness to put things in a cupboardy gadget and slam the door on it until a later time. I found it infuriating- you couldn’t rinse out the coffee plunger because the sink was full of tea cups. There were women bustling about in every direction around the sink in a very small kitchen; I nearly starved and had severe caffeine withdrawal over the period of the meeting. What is useful and helpful in one women’s life is the very epitome of a bloody hindrance in another’s. Today was mercifully free of people arguing about the rights for small plaques to exist in desolate rural settings and I abandoned myself to a large pile of pinecones and my Fairy. I photographed all afternoon; the camera manual in one hand, hot glue gun in another. I have learned a lot about my digital picture taker in the process- less about pinecones. They are pretty self explanatory, but very nice when decorated. World Famous in the Wairarapa! What more can I say? The local rag has the full scoop on my ANZAC Bridge Fellowship. I’ve been working on fairies and pinecones for my craft book with a difference. Fairy Good will tell stories along with making things- her pinecone companion will offer sage and unheeded advice- Adrian thought it's rather a reflection of our marriage! Lets hope it's a successful a union. There’s a lot of craft work, photography and illustration- both traditional and digital going on in this creation and the time I have up here is fantastic for exploring it until I perfect how it will be. I can be overly fussy- a rare indulgence I don't usually have in my working life. Thursday was a migraine, Friday was spent downing panadols and working on giant poppy bases and bird pictures for the ANZAC Bridge ceremony, Saturday I had enough time to take a deep breath and then welcome 8 children to my attic space to work on poppy petals. We cut out pieces of red card, glues red dyed skewers to them and then put hands in paint and printed palms on them to make personalised petals. The kids particularly enjoyed the painting part. I did that outside in the glorious sunshine which has graced most of my residency. We then choreographed a performance for ANZAC day which involved much swooping of birds and spiking large polysterene balls with said poppy petals. This will all take place on Wednesday under the gaze of a military guard from Linton. We hope the weather will do us a favour and not blow us and the poppies off the bridge down the river and beyond. Everyone is making plans now to leave the residency; their time is up. Kay, the director leaves for San Francisco on Thursday, after ANZAC day. Kyle goes tomorrow, to Lochmara Lodge in the Marlborough Sounds, where she is doing another art residency for a week before travelling the rest of N.Z and then back to Massachussas to find waitressing work to fund her Masters starting in September. Dorothy leaves on Friday (?) for Nelson, or Hastings, and I pack up and go home on Saturday, so will lock up the villa, turn off the lights and leave it for the new directors and artists taking up residence in May. 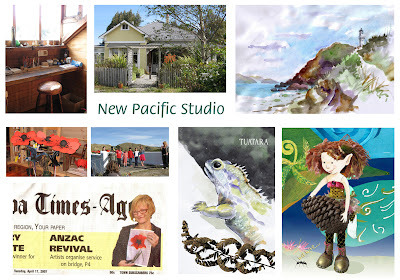 Each of us will leave a little part of us behind in the form of artwork in the Wairarapa, condiments in the pantry and wistful artistic sighs woven into the fabric of the studios here. It’s a wonderful thing Kay has created, and I shall always treasure my time spent here. Eh noho ra. Tired out from a day at Eketahuna School making pine cone critters, having lunch with Gallery curators and discussing a massive retrospective on Welligton Polytech Design School, photocopying ANZAC day programmes, dropping Kyle off at the railway station on her way to the next part of her adventure, returning to clear cutting images in Photoshop, finishing poppies for the Bridge Celebrations. I have never ever bothered to attend any kind of service for ANZAC day before- and now I am a major part of the proceedings! Then off to Castlepoint I went, by my lonesome in the trusty Galant. The autumn countryside was heartbreakingly lovely; full of silver, gold and rust colours. I have never been out that way before so had little idea of what to expect. Have any of you ever been to Castlepoint? I know our offspring haven't. All I can say is- kids, get your drivers licences; there is a whole New Zealand out there you are missing because you won’t go anywhere with your parents anymore! The East Coast of the North Island somewhere I never go; especially the lower part. But wow- what a wild and gorgeous coastline, full of bizarre rock formations like some giant pushed clay up with a broom and had a go at sculpting it before getting bored and leaving for other shores. It’s all limestone and breakers; there are tsunami warning signs on the beach. I wonder how the bach owners along the sea front feel about being swept away? I walked up to the lighthouse and around the cliffs- today was still and lovely. You wouldn’t want to do it on a bad day; there are warning signs about that too. There was a familiarity to the place, then I got it- the air has just the same quality that I found on the Cornish Coast. The energy of the waves crashing and pounding at the cliffs must exude that particular feel. It makes me want to yelp with delight, and confirms yet again that I am not an inland lover; the sea will always draw me. At the opposite end to the lighthouse, Discovery Cove awaited exploration, so off I trotted, tracing the footprints of others walking dogs and ‘taking the sea air’. Up and up a steep track (yes me- a hill walk) to a point at the top where Christmas Bay lies on the other side. Too far to walk to, but I snapped dozens of pics for future reference. Back down again and along the beach to a spot where I did a watercolour. The paper buckled a bit so the scan quality is dubious, but it’ll give you an idea of the delights to be had with a watercolour box. And suddenly it was 4pm and time to go if I wanted to get home before dark. The ANZAC Day celebrations went really well today with 150 odd people turning up of all ages. The kids performed their poppy making. Some of the petals flew off in the breeze. We shall call it kinetic art, or transformational art; whichever you call de-nuding flowers on a bridge! But it all seemed to be appreciated by everyone; especially that children were participating in a service that seems relegated to the 'oldies'. All was followed by afternoon tea (scones and jam) at the MT Bruce wildlife centre where I managed to snap the Takahe pottering about in the autumn sunshine. Dorothy and my mission is to get Kay, who I swear hasn't slept in a week to the train station tomorrow. After that, it's trap a few more mice (my drying apples in the hot water cupboard are a huge small rodent draw card) and clean out the left overs in the fridge before taking off to Wellington on Saturday. I'm a long way down the track with my projects and hope not to be too diverted by domesticus when I get back. Quite happy to be distracted by having a laugh with my family though; you all keep me well grounded! Yes, Kay got the train in the nick of time. I will be having the kittens shortly. Dorothy and I have had a nice afternoon and quiet evening. I have sore thumbs from sewing Wearable Art. I am using the rafters to good effect to hold up the crinoline whilst I make a 'tree trunk'. One final day to get the tree bit done tomorrow- we haven't any handy rafters at home, except in the attic which is a bit of a squeeze and a mission and not a work space at all. Bach properties in Castlepoint start at $750,000 so I have stopped with that idea. Adrian will be very relieved (won't you my sweet?). So can we convert the loft instead? I got the tree trunk sorted, made some roots, tidied the attic, put everything in boxes and now it is finished. The residency I mean- the work is never complete- just as you finish one project another takes it’s place. Well, I may not get grants and funding, win lotto or scratchies but I sure as hell can write a silly poem and... get this... win a case of Lindauer Special Reserve a month for a whole year! Here is the poem I won the Lindauer Birthday Competition with. To make it doubly noticeable, I painted it on a large canvas. Cheers! And melt away our troubles. Dry, but wet and Brut. From the faithful garden oak. With a glass or two of Sec. Exposed to rain and thunder.